Muench chose to use “Far West” in the name of his writing, editing and public relations consulting business because of its historic connection to the pioneer spirit of the immigrants who forged Missouri and later states out of the American wilderness. “Far West” was the pen name of Friedrich Muench, James Muench's ancestor who in 1834 led a large expedition of immigrants to Missouri. Named the Giessen Emigration Society, after the University of Giessen in Germany, the goal of the group was to form a new democratic state in the New World that would serve as a model for the future Germany, which was still a disunified patchwork of independent principalities. Muench and his compatriots were political revolutionaries working for a democratic Germany, and were being monitored by the authorities. Friedrich Muench wrote extensively newspapers and periodicals in German and English for the American market. He also wrote commentary for periodicals back in the Fatherland under his pseudonym. James Muench, whose middle name of Frederick recalls his notable ancestor, has always felt a connection to Friedrich because of their common interest in writing and sometimes considers himself "Far West 2.0," although he would be hard-pressed to match the eloquence and output of his great, great, great grandfather. While the society’s dream did not work out entirely as planned, Friedrich settled near the Missouri River and wrote articles published in newspapers in the United States and Germany under the moniker, “Far West,” which Missouri was considered at the time. Known as “Papa Muench” to the Missouri Germans, he played a notable role in its politics throughout the 19th Century and especially before, during and after the Civil War, when he served in the Missouri legislature. 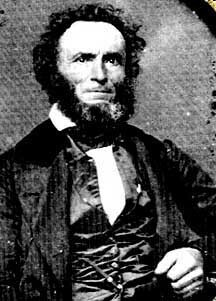 His strong stand against the evils of slavery is a source of pride to his descendants, although it made enemies at the time among those Missourians who didn’t cotton to idealistic newcomers questioning their ways. The Teutonic Cross uses the German-American immigrant experience as a backdrop.